I’d done this before, many years ago, but the attempt was quite poor. 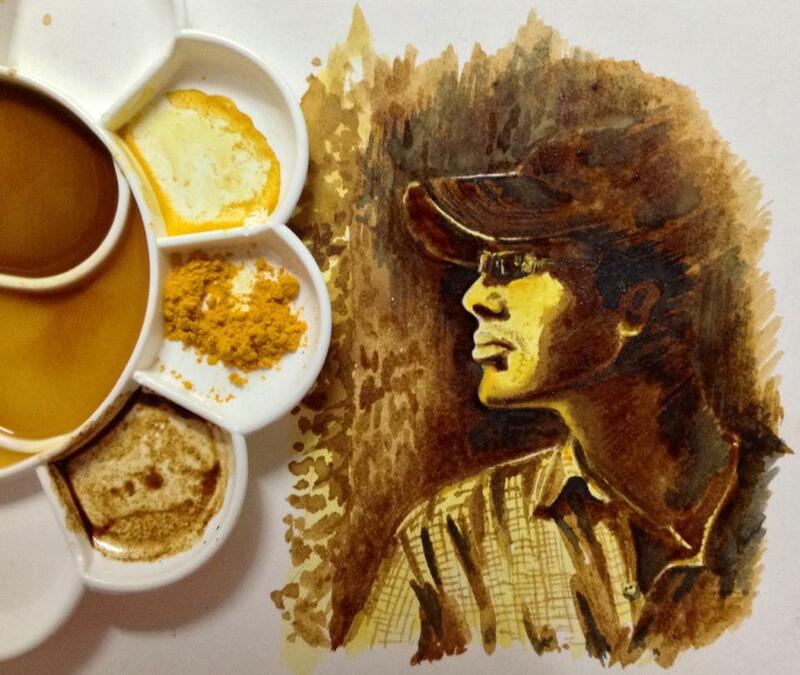 So now, determined to get it right, I tried using coffee to paint again and here is the result. For this piece, I teamed coffee with another unlikeliest culinary ingredient – yes that is turmeric. Very Indian, very yellow. I didn’t like the way turmeric felt on paper, because I found it too grainy. It does leave a nice yellow stain that is nearly impossible to lift. Perhaps a finer ground turmeric or a filtered version of the powder would work. But it’s nice to think that both the pigments came from natural sources. I only used black paint to do the contrast areas in the picture. Now I am wondering about natural pigments, and I want to know more about how ancient art was created using these organic pigments. I used a picture of my husband for this piece. I felt that the strong light and shadows would render well with coffee. Initially intended as trial scrap, it turned out fine enough for me to preserve it forever, especially for you Srijoy.